I’ve always loved this photo that I took on my first trip to Peru in 2008. Its taken in the Colca Canyon where we had been searching for condors. The condor outlook proved to be fair but the other photo opportunities were magnificent. We had stopped at this village for a quick snack break & caught these dancers in front of the church. Soon we were off to Chivay but this image was memorable. 05 Mar	This entry was published on March 5, 2013 at 12:00 am. 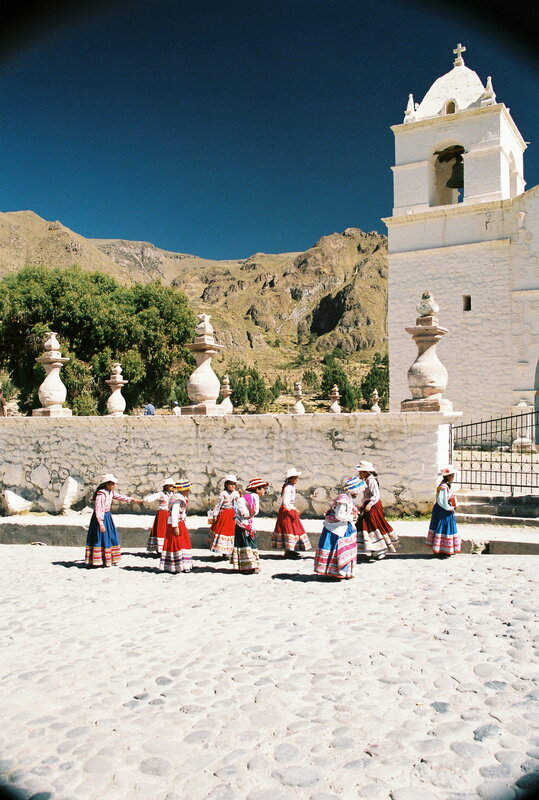 It’s filed under Photography, Uncategorized and tagged Andes, Colca Canyon, Outdoor photography, Peru, photography, photos, South America, travel, travel photography, Travelogues. Bookmark the permalink. Follow any comments here with the RSS feed for this post.